The major Martian dust storm of 2007 filled the sky with dust and produced conditions that prevented the THEMIS VIS camera from being able to image the surface. With no new images being acquired, we've dug into the archive to highlight some interesting areas on Mars. The this week's region is Apollinaris Patera. Apollinaris Patera is an old volcano that has undergone extensive erosion. 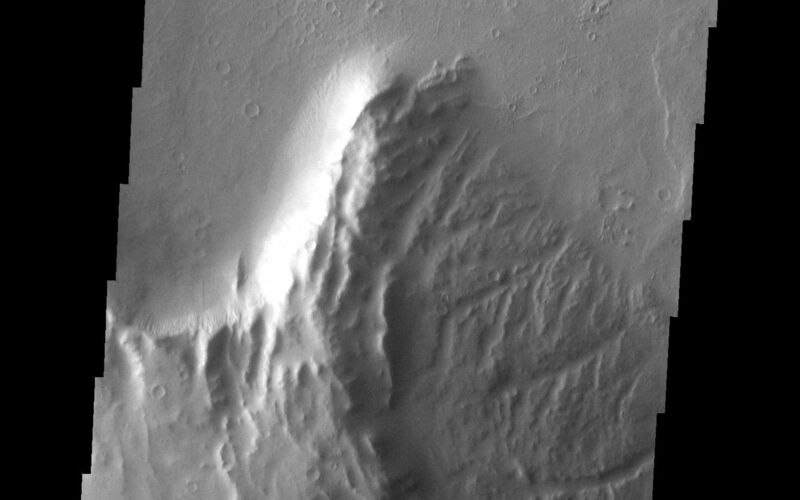 This volcano is located north of Gusev Crater, the home of the rover called Spirit. Part of the summit caldera is shown in this image. Image information: VIS instrument. Latitude -8.6N, Longitude 174.0E. 18 meter/pixel resolution.